Eastern & Mountain District Radio Club Inc. In memory of Jack Gutcher, VK3APU, who was a foundation member of the Mountain and District Group, a small group of Amateurs who helped to operate the local civil emergency group for Mt. Dandenong and districts. 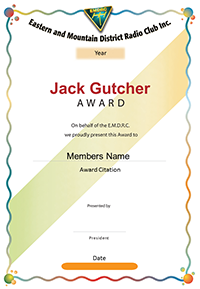 Jack helped form a radio club for the Eastern suburbs, known today as the EMDRC, where he was foundation Treasurer for many years, later holding many other active positions. He became a Silent Key in 1978 at the age of 60. A copy of the rules are here.